Below are some links to galleries of pictures from recent meetings and events. 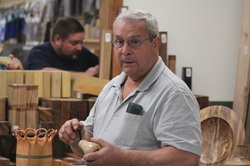 Members are encouraged to bring in their work, so that others can see what can be made on a lathe, to show off their skill, or to get a question or two answered. Any project, at any stage, can be shown, as long as it is in some way related to woodturning, or using a manual wood lathe.